You are in the process of verifying the configuration on one of the switches in your network. You want to ensure that STP has created an optimal path to the root bridge. You issue the "show spanning-tree" command. Which port cost should you see associated with a 100 Mbps link connected from the local switch to the root bridge? Which best describes the problem with unidirectional links? Which one of the following is not a problem solved by STP? Which is a feature of the stateless autoconfiguration? Which command should you use to configure EtherChannel load balancing based on the Layer 2 information of the sender and receiver? Review the switch configuration. What can be determined from this configuration? A. Port security has not been enabled on the fastethernet 0/1 interface. B. IP Source Guard is enabled on port 0/1 with IP source and MAC address filtering. C. The maximum number of IP addresses allowed on port 0/1 is 2. D. The percentage of DHCP packets that the fastethernet 0/1 interface can handle is 50. Which is a feature of the SNMP? If a distribution layer switch goes off line and then comes back online, which NIP mode applied to other distribution layer switches will assist it in determining the correct time? 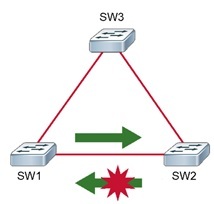 When configuring a switch, which Cisco IOS command needs to be issued to specify that the port will function at Layer 2 and places the port in VLAN access mode? Which is a feature of NTP? Which SNMP version introduces security features? Which discovery protocol can be used by non-Cisco network devices to advertise information about themselves to other devices on the network? Refer to the exhibit. You have configured two routers as VRRP virtual routers that are members of the same VRRP group. What should you configure to ensure that suboptimal paths are not used if an uplink fails on the VRRP master? A. It is a switch virtualization technology. B. Switches can be added or deleted from a working stack without affecting the stack performance. 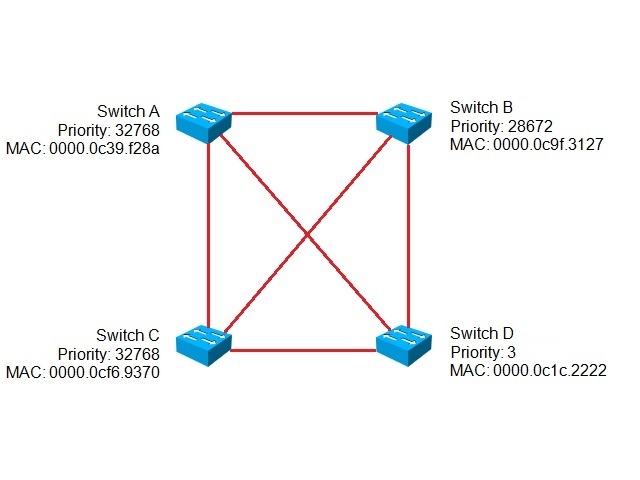 C. A virtual link is created between switches in the stack. D. Each stack of switches has a single IP address, and it is managed as a single object. E. It is made up of up to eight 10 Gigabit Ethernet connections bundled into an EtherChannel. Which statement is incorrect when securing NTP using authentication and access lists? Which command can be used to verify if 802.1Q encapsulation is being used? D. Configure the VTP domain name as "null"
Which feature best describes the EtherChannel configuration? Which SDM template type is recommended when networks consist of a large number of devices? VTP has been configured and all VLANs have been configured as private VLANs. An administrator has discovered that VTP updates are not propagating to all the switches. Refer to the output. Which switch should you troubleshoot? What happens when an interface is shut off in a topology? Which command is used to enable UDLD on copper cables and want it to try to re-establish a connection before declaring the port error-disabled? Which STP implementation allows for a custom number of STP instances where VLANs can be grouped into? 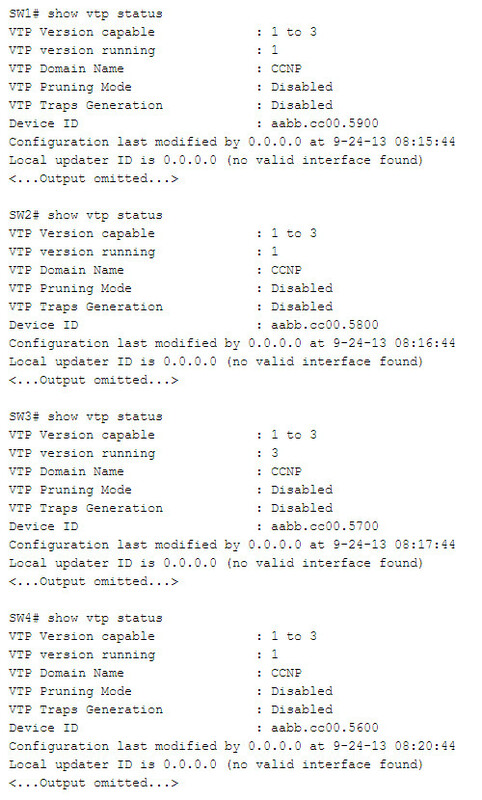 Which is not a configuration option for SNMP? Which guideline should be followed when adding a new switch to an existing VTP management domain? Which of the following is not a feature of ARP spoofing? Which code enables PortFast on all switchports? You have replaced a faulty switch within the VTP domain. Which is a step in recovering the root-inconsistency state? Which is not a method for setting the system clock? Which hash input code represents a source and destination MAC address? What is a feature of StackWise? Which is not a method of providing the DHCP service? What statement describes the need for First Hop Redundancy Protocols (FHRP)? Refer to the exhibit. Which port feature should be enabled to prevent the inherent issue? Which best describes a function of the DHCPv6 server when the client is able to use stateless autoconfiguration? A link between two switches is configured as "switchport mode dynamic desirable" at one end and "switchport mode access" at the other end. In what mode will the link be operating? 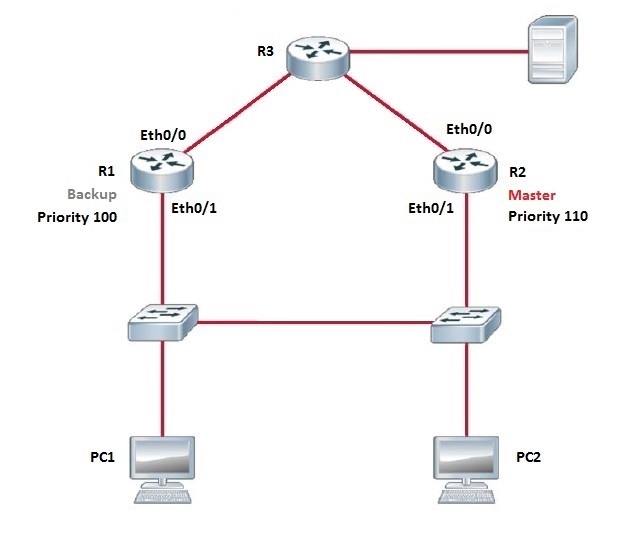 What is needed to have multiple routers function as a single virtual router?